I wake up this morning feeling like I’ve turned a new page. I spent just under five years working at the Kansas State Collegian, the student newspaper at Kansas State University. I served in a lot of different positions, not always well and certainly never perfectly, but always intently. Today though, when you turn the pages to the middle of the Manhattan Mercury, you’ll be able to find what is in many ways a turned page for me as well. Perhaps fittingly, that page is turned to the Sports section. Last night I wrote my first article post-Collegian work, you can read it here. I covered Rock Creek High School’s first game in the 4A Division II high school baseball tournament here in Kansas. It was a series of firsts for me. It was my first baseball game covered at any level. I’ve been a fan of baseball since elementary school, my love of the game predates my love for every other major sport except hockey, but I’d never covered a game. I’d never been to a high school game, let alone been in a press box for one. I’d also never covered a sporting event for any publication other than the Collegian, where I was blessed enough to cover K-State Soccer, Women’s Basketball, and to help cover Football in 2016-2017. And while last night’s coverage was far from perfect, it was a start I’m hopeful about. I’m hopeful for the way I was able to write it and get it submitted fairly rapidly and with little instruction. I’m hopeful about the way I was able to travel and handle the multiple logistics that come with traveling to a game alone to cover something. I’m hopeful about the way I was able to get it right without a better journalist looking over my shoulder, and the way I was able to basically blend in among the other press-box media members and game officials. None of these things of course is the least bit remarkable. Any journalist of any mediocre ability should be able to master them without err 100% of the time. Yet left alone independently I was able to not screw up. I didn’t lose the proverbial game for my proverbial team. I didn’t win it for them either, but human history is rife with examples of people who started their careers simply by not screwing up big opportunities they were given. In doing so, they left the door open to receive bigger ones later on. History is also rife with examples of people who tried too hard to make the most of their initial opportunities and who ultimately failed because of it. I’d like to think I’ll prove to be in the former group, but even if I am to fail, I don’t think (having not gotten any feedback yet from my new bosses) that it’ll have been because of yesterday. I don’t intend to throw away my shot, but even if I throw one away, I don’t believe it was yesterday’s. And that, friends, pumps me the heck up. On Saturdays we wear purple, watch college football, and drink wonderful things. 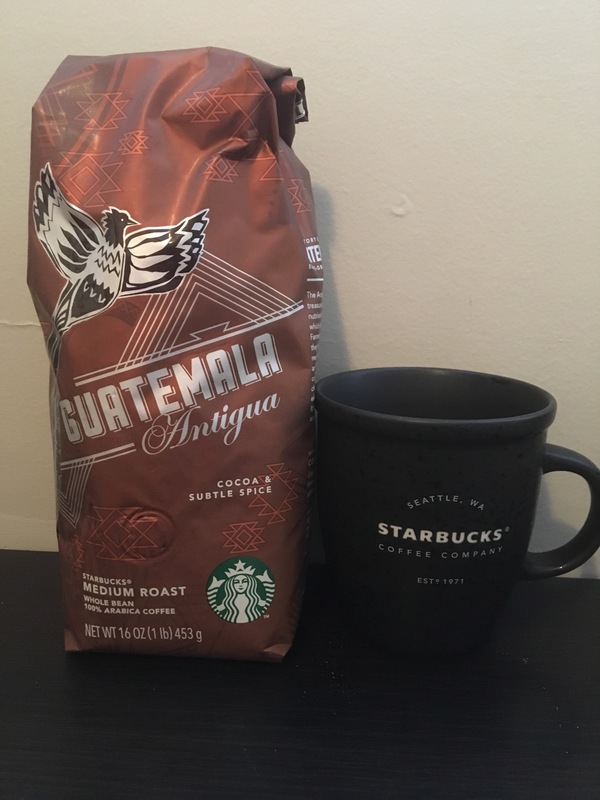 “Elegant and refined with layers of unfolding flavor…” – the description on the bag of Starbucks Guatemala Antigua Blend. That’s about how I feel as I start my last Thanksgiving break as a college student. It was cloudy and cold yesterday here in Manhattan, but today is clear and sunny, with a high about 10 degrees higher than yesterday’s. There’s something poetic about that. Today is a day where students, faculty, and staff alike can collectively breathe a sigh of relief after an emotionally draining semester that has featured a controversial presidential election, enough celebrity deaths to lose count of, and a bout with illness for seemingly everyone. All of us are ready for this vacation. Even those who still have to work have a slightly easier week with very rare exceptions. What I’m really writing to tell you is that today I feel elegant and refined, but I need a little more refining to become more elegant. Traditionally, I have always written out my goals for the next year in the week leading up to my birthday in August. I haven’t done that this year though. This year, I’ve simply been too caught up in all the wonderful and chaotic changes that have happened in life. This, however, is not the year to forget to create those. As I hung out with a friend at her work yesterday, I started to reflect on where I’d been this year. Yet even as I tried to reflect, I realized so many changes were ahead that I simply wasn’t able to feel reflective. By this time next year, I’ll have graduated college. I’ll be starting the next phase of my career. Maybe I’ll be in Austin, Texas, or in Shelton County, Washington, or in Casa Grande, Arizona, or in so many other places. For all the wonderful changes that have come as I’ve transitioned to primarily sports-journalism and been honored and blessed to have begun covering women’s sports, the next year will bring even more changes. The next year will bring even crazier ones. Life, by this point next year, will have begun to evolve, and it’ll never be the same. So today, I’ll start writing out my goals for that time. Spiritual, Personal, Professional, and Athletic. They won’t mean much to the stars or the coming sunrise that is the future. But they’ll mean a lot to me, and that’s kind of the point. A couple of months ago, I semi-jokingly told my dance teacher I would move to Canada if Donald Trump won the election for the President of the United States. Perhaps at the time I was. But as this election nears its finale, I’ve come to the realization that now more than ever is not the time to flee this country; it’s the time to stand fast and brace to make the best of it, regardless of which unfortunate outcome prevails. That’s especially true for journalists. It is my firm belief that Mr. Trump represents a significant threat to the 1st Amendment and its protections. It is further my belief, based upon statements made by Mr. Trump and his willingness to revoke media credentials even to the highest-calibre news outlets, that Mr. Trump represents an existential threat to journalism as an institution. Lastly, based upon his stated sympathies toward Russia president Vladimir Putin, I believe Mr. Trump would consider going possibly even as far as Mr. Putin has in suppressing the voices of journalists, possibly even to the point of imprisonment. Though Mr. Trump has not stated that explicit intention yet (partly because it’s for the time being illegal), I believe his previous attitude toward the 1st Amendment and the journalism “media” are indeed indicators of the possible perils journalists could face should Mr. Trump win this week’s U.S. election. Because of this, I have come to realize that though I love sports reporting, if Mr. Trump wins the presidency I’m not going anywhere. Except maybe into political reporting. Throughout this election, we have seen a number of women come forward and reveal that Mr. Trump had sexually harassed them, and in many cases sexually assaulted them. We have seen Mr. Trump mock these women, discredit them, and offend them time and again. It seems to me Mr. Trump has done so in order to suppress their voices, particularly so he can continue to obtain power. Let me be clear: Mr. Trump has sought to suppress the voices of both the journalism writers attempting to give him the same amount of coverage as his opponents (which they are bound by journalism law and ethics to do), and at the same time worked to discredit victims of his own misdoing. The combination of the two tells me there is nothing this country is about to need more than passionate, pure, driven news reporters willing to stand up for the rights of all citizens to be heard, including and perhaps especially victims. There is nothing more dangerous to a democracy than politicians and people in authority who are able to operate without the public accountability. I can’t turn my back on a country that needs good writers and hungry reporters as much as we as a nation are about to. Although I don’t like either Mrs. Clinton or Mr. Trump, I believe the later might very well seek to limit freedom of speech the same way many of his supporters think Mrs. Clinton will limit the right to bear arms if elected. I have a conscious….concern that Mr. Trump will stop at nothing when seeking to silence those who oppose him, a danger all the more perpetuated should he become what many consider the most powerful man in the world. A Trump presidency, in my opinion, represents a potential threat to the life and livelihood of every journalist in the United States. If Mr. Trump doesn’t win, however, we’ll still need those same good men and women to make sure the rights of others aren’t oppressed either. Regardless of the outcome, I will be one of them. What Do You Want To Ask Gen. Meyers? I want your questions for K-State’s new interim president. Last week, retired Air Force Gen. Richard B. Meyers was appointed to serve as the interim university president at Kansas State University, according to Danielle Cook of the K-State Collegian. Wednesday, he’s holding a press conference, and I get to write about it. Details are still being confirmed, but there’s a possibility I might get ask him one or more questions, or, at the very least, that a room full of journalists might ask him something you’ve been wondering about. So I want to hear from you. What do you want me to ask? What are you most curious about? What topics would you most like to hear Meyers’ responses to or regarding? Disclaimer: I can’t promise to ask him any or all of the questions submitted because I don’t know how much time, if any, I’ll be allotted. So I apologize if I don’t get to yours. Still, I’ll do my absolute best to craft the most thorough story possible with the intention of answering as many of those questions as I can. So tell me what you want to know. Here’s a link to his K-State profile if you want to know a little bit more about him first. Comment below, hit me up on social media @poet598, or just contact me via the form on this page on this blog. Have a great day everyone! Thanks for your support and feedback! I wrote this for the Kansas State Collegian in April 2016. I want to apologize in advanced for flooding your inbox today with posts. I’m an aspiring professional-journalist and have decided my blog needs a place where potential employers can find my best work. So today, I’ll be posting five to seven different posts with the title starting “Portfolio:” I’m sorry for any inconvenience this one-time flooding of your inbox causes you. This just could prove vital to my professional success later on in life, and I believe there’s never a good time to bother your readers, so I’m going to do so as quickly as possible. Sorry for the inconvenience, but thank you for your continued reading :).